The Nyack College Writing Center will host a “Get Creative! 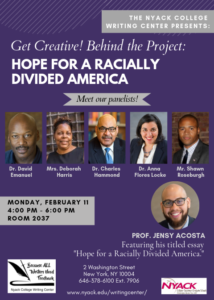 Behind the Project” event featuring Jensy Acosta, an adjunct professor in Nyack’s Bible department on Monday, February 11, 2019 from 4:00-6:00 PM in Room 2037 on the Nyack New York City campus located at 2 Washington Street. He will share from his essay, “Hope for a Racially Divided America,” and examine racial inequality in light of Jesus’ prayer: “that they may all be one, just as you, Father, are in me, and I in you, that they also may be in us, so that the world may believe that you have sent me.” (John 17:21-22, ESV). 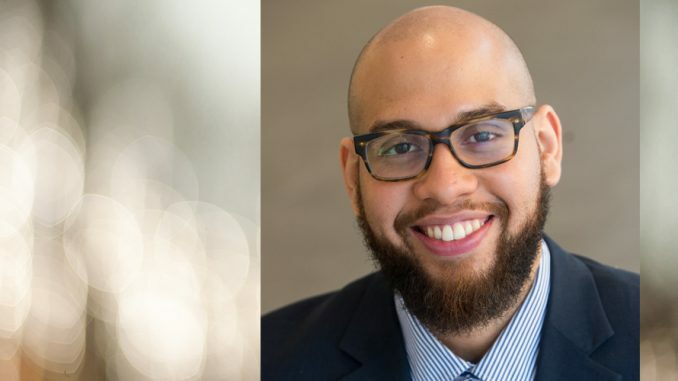 Prof. Acosta is a 2009 Nyack College alumnus who earned an undergraduate degree in biblical and theological studies. He completed a master’s degree at Princeton Theological Seminary. A panel of responders will include Associate Professor of Bible, Dr. David Emanuel; Assistant to the NYC Dean of Students, Mrs. Deborah Harris; NYC Dean of Students, Dr. Charles Hammond; Assistant Professor of Mental Health Counseling, Dr. Anna Flores Locke; and Director of COMPASS Services/ Assistant HEOP Director, Mr. Shawn Roseburgh. For more information, contact the Nyack College Writing Center at 646.378.6100.